Is John Lennon More Popular than Jesus? Today, October 9th, marks what would have been John Lennon’s 77th birthday. In case you truly live under a rock, John Lennon co-founded The Beatles—only the most commercially and musically influential band in history — and was an important activist during the 1960s and 70s. His music both with the band and as a solo artist embodies his rebellious and sharp-witted nature. But it’s not only his influence in music that has managed to span generations: his fashion sense, influence in politics, and presence in popular culture makes Lennon as relevant as ever. In honor of his special day, Jerk presents you a case for why John Lennon just might be more popular than Jesus; or, at the very least, why he’s the Jesus of pop culture. Lennon’s trendy “teashade” sunglasses We know you know which sunglasses we’re talking about. Say his name out loud. What image comes to mind? Is it the one we’ve included above? Probably. Lennon popularized these glasses, which are small, round thin wire frames and are usually found in mirror tinting, or in such a light tint that they still show your eyes. Shop Rayban’s version here, or Amazon’s much more affordable doop here. Lennon may or may not be the face of early marijuana legalization In 1972, John Lennon, along with the rest of the United States, faced a big problem— President Nixon was running for reelection. During the Republican National Convention, it was rumored that Lennon planned to take part in a concert held in San Diego, where he would sing “Give Peace a Chance”— a track which emphasized the best way to do so is to vote against Nixon. The Nixon administration got word and tried to have the MBE (Most Excellent Order of the British Empire) deported, which would’ve been possible because of Lennon’s former guilty plea to a misdemeanor charge of cannabis possession in London in 1968. (US immigration law at the time banned admission of anyone with a drug offense). Leading writers and artists initiated a letter-writing campaign to let Lennon stay, arguing he was a “cultural asset” for the USA. Lennon appeared on the late-night Tom Snyder show, where he gave his side of the story. His attorney even went on to describe the charge, and the US government’s claim that marijuana “is danger” seemed absurd and unrealistic. Here that? It’s all of us saying “amen” 45 years later. He completely redefined what it means to be a celebrity Before The Beatles, every aspect of an entertainer’s life was dominated by their record label. Many musicians were forced adopt media persona. Think: Joe Meek, Tornados’ producer pretending until 1966 to not be gay. Lennon was even encouraged by his own manager, Brian Epstein, to keep his marriage to Cynthia Lennon— his first marriage— a secret. Epstein believed nobody would take to kindly to a married Beatle. The Beatles were encouraged to appear as four well-dressed, well-mannered British bachelors, but this “persona” broke down quickly, as Lennon was unable to hide his wit or strong opinions. He sung about battering women, excessive drinking habits, and drug use. Through his lyrics, Lennon made it evident that he was a regular human, just like everybody else, and had his own skeletons in his closet. Ever since, celebrities more commonly show their fans who they truly are, whether it’s through song lyrics, holding “conversations” with fans during shows or concerts, or participating on social media and television shows and interviews. 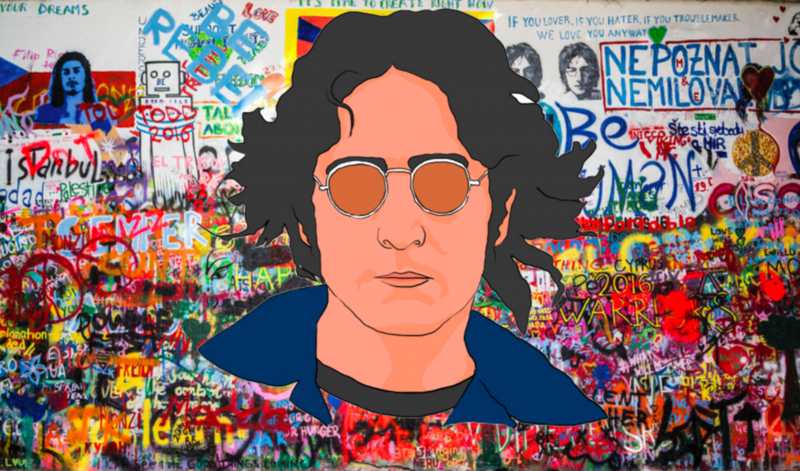 “Imagine all the people” who are STILL artfully influenced by Lennon’s most famous solo track In October 1971, Apple Records in the United States issued John Lennon’s solo track, “Imagine,” which quickly became his best-selling hit as a solo artist. This song is today revered as an international peace anthem. The lyrics are continually used in great works of art, and recently inspired a picture book, “Imagine,” by John Jullien, to teach children the importance of peace before they can even formulate full sentences. In Prague stands a wall that was once plain, but is now filled with Lennon-inspired graffiti and parts of lyrics from Beatles’ songs. Plus, if you’ve been to The Wall, you’ve probably ‘grammed it, and made the caption lyrics from “Imagine,” which – TECHNICALLY – is also art. Pop culture wouldn’t be what it is today without John Lennon In 1966, the London Evening Standard ran a series of articles called “How Does a Beatle Live?” which was, essentially, a way to humanize the Beatles and allow the public to learn a bit more about each of the four men. In an interview at Lennon’s home conducted by journalist Maureen Cleave, Lennon claimed: “We’re more popular than Jesus now; I don’t know which will go first – rock’n’roll or Christianity.” This remark was half true – Christianity was in decline in the UK at the time, and church attendance was as low as ever. Reverend Ronald Gibbons even told reporters that a Beatles version of “O Come All Ye Faithful” might give the Church of England “the very shot in the arm it needs.” The US did not take kindly to Lennon’s remark – a popular teen magazine, Datebook, published the quote and, thus, the “Down with the Beatles” campaign began; churches held burnings of Beatles records, the Vatican denounced Lennon and a handful of countries banned the group’s records. Lennon was apparently being sardonic, but before this, pop culture had been thought of as a “kid’s thing” and very ~unimportant and ~unintelligent. Lennon helped shape pop culture into a social force to be reckoned with. If you’re thinking about losing your religion, you might want to think about jumping on the pop culture bandwagon.